Gardens and other thriving outdoor spaces provide significant benefits to residents in senior living communities. For residents who have a passion for gardening, giving them opportunities to tend flowers and vegetables not only keeps them physically active, it also stimulates the brain. This is especially true for those living with memory loss. Even if they don’t spend time digging in the dirt, having the opportunity to relax in an outdoor garden space offers numerous health benefits. If you are interested in adding an outdoor space to your facility, we have several dementia garden design tips, whether you are planning one for your current facility or are considering one for an upcoming construction project. It’s estimated that 7.7 million people are diagnosed with dementia annually throughout the world. 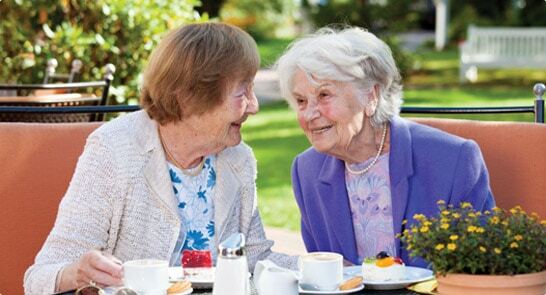 A majority of those living with memory loss reside in a senior living community. And, a 2014 study found that residents with memory loss—as well as their families and facility staff—benefited greatly from having access to outdoor gardens. In fact, according to one horticulture expert, the sense of smell from fresh herbs and flowers connects “to the limbic system in our brain, which affects memory and mood.” And, happier, less stressed dementia residents are likely to have a positive effect on the mood of your staff and their families. Studies also have found that just having a view of nature helped surgery patients recover faster and take less medication than patients who did not have access to a natural setting. Therefore, those who are recovering from an illness or medical procedure would benefit from access to outdoor spaces. Provide residents easy access, especially for those who are less ambulatory, to the garden from your facility. If you have enough space, set up pathways so that residents can walk shorter or longer routes, depending upon their abilities. Consider creating an outdoor space with a circular design, including paths that guide residents. Dead-end pathways can cause confusion and anxiety. Develop the garden in an area that can be easily seen from indoors. Includes plants that have visual appeal throughout all seasons, such as shrubs or ornamental trees that sprout red berries in the fall and winter. Include bird boxes and feeders for an added attraction. Include seating and shade for those with less stamina. Seating also provides a reason to sit and visit with family and friends. You may also consider water fountains in these areas for added sensory stimulation and relaxation. Include low-maintenance plants that also are easily recognized by your residents. This will help trigger their memories of their homes and a time when they tended to gardens of their own. Avoid potential hazards like steps and slippery material surfaces, ensuring safe and secure pathways that incorporate decorative railings and fences. Ask a local florist to teach a basic flower arranging class using flowers from your garden. Display the arrangements throughout your facility or gift them to other residents or staff members. Participants will benefit from making social connections, as well as from physical and mental stimulation. Host events in your garden, such as a garden party, a picnic or even a movie night. Considering decorating the garden for each holiday. Seek help from residents whenever possible. If you are considering a dementia garden design for your senior living community, or would like to evaluate your outdoor space, contact us or call (920) 969-9344 to schedule a free introductory meeting. If you care for those living with memory loss, you may also be interested in reading our Interior Design for Dementia Homes blog.